Enabling SPF and DKIM Keys in Centos Web Panel [CWP] - Preguntas Frecuentes - FAQ - VipHosting - Hosting en chile, streaming y Dominios. In this tutorial we will be guiding you on how to enable SPF and DKIM in CentOS Web Panel. As you see in above image v=spf1 is not enabled yet. Lets enable SPF manually. 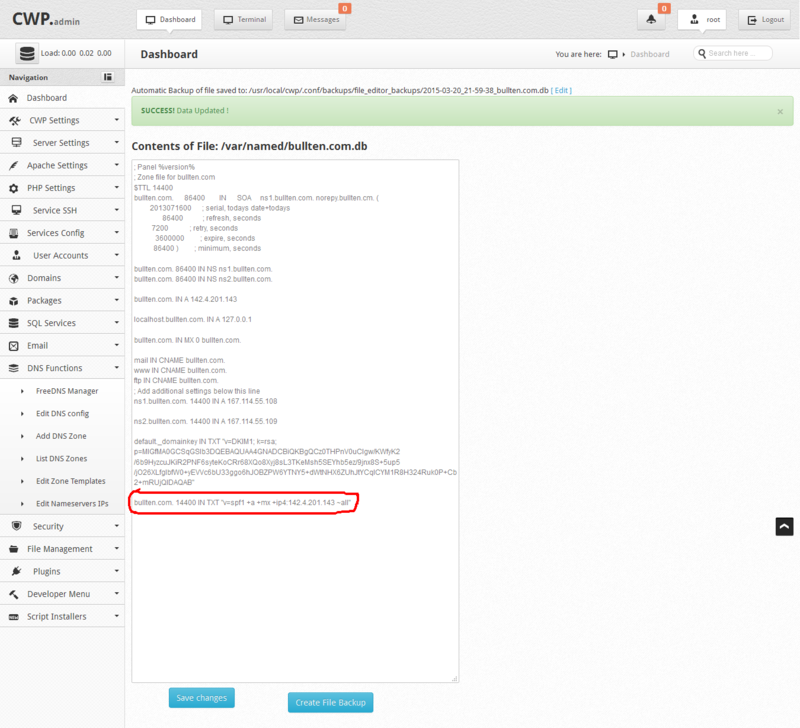 4) Navigate to DNS Function –> List DNS Zones and there you will see your domain name and infront of it there is Edit File button. Click Edit File and Add below entry. your-domain-name. 14400 IN TXT "v=spf1 +a +mx +your-ip-address ~all"
You have successfully enabled SPF. Now lets make DKIM verification working. 5) open /etc/opendkim/TrustedHosts and add your hostname. 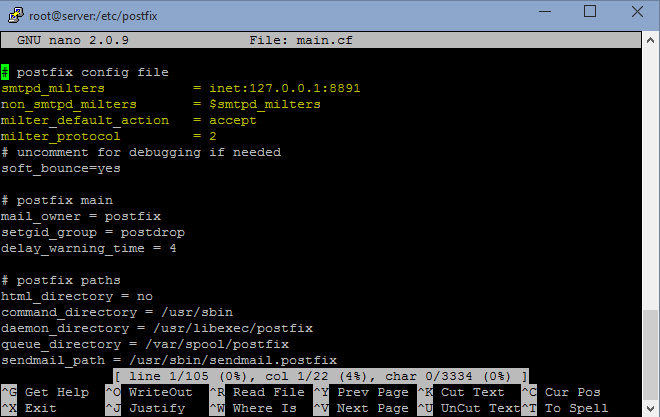 6) open /etc/postfix/main.cf and add the lines below. You are done with enabling SPF and DKIM Keys. 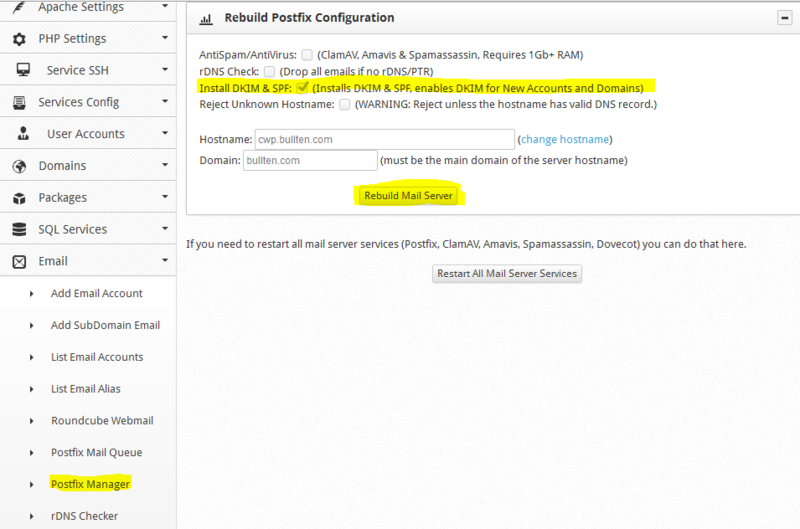 Now login to webmail (http://yourdomain.com/webmail) and send email to check-auth@verifier.port25.com to verify if everything is setup correctly.